Lengkuas island has crystal clear water, so clear that in some shallow areas you can see right through the seabed and see fishes swimming. Not only that, Lengkuas is a friend for travelers who want to relax, sunbathing on the white sand beach accompanied by tropical breeze. Visitor to this island should choose the right moment because in a particular month like December to January the waves will be bigger than usual. These big waves make the voyage to the island would be at high risk of accidents. It’s always better to take the trip to this island in March until November since the waves tend to be calmer. 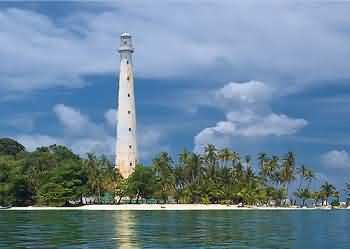 Lengkuas Island has a lighthouse which was built in 1882 by the Dutch colonial government, and until now is still serving as a signpost for the ships that traverse the island of Bangka Belitung. 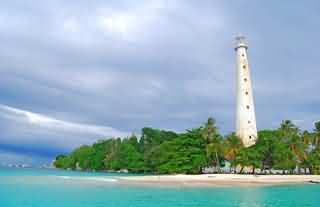 It’s about 50 m high, takes extra energy to climb to the top, but it’s worth it because from the top of this lighthouse we could see the whole side of Lengkuas island. There is also a large granite rock protruding in the middle stretch of sea water. And the beauty is completed by the view of belitung Island covered by the clouds in a distance. 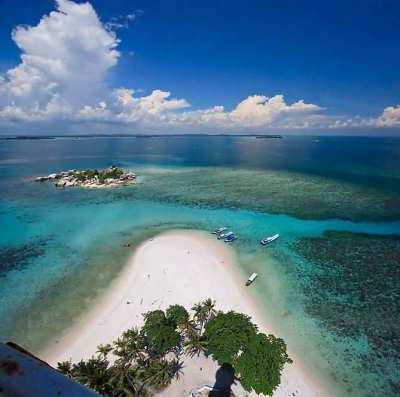 There are many alternatives to reach this island, you can reach it through Kelayang bay, Binga bay, or Tinggi bay. From those 3 places, you can rent a fishing boat to cross to lengkuas for about 20-40 minutes. It will cost you around USD $35 to USD $50, quite expensive, but once again.. it’s worth it. There’s no accommodation for tourists who want to overstay (hey, it’s less than one acre, who would build an inn there? ), they must stay at Tanjung Kelayang(about 20 minutes from Lengkuas). However, if tourists want to stay on the island, they can bring their own tent. There are toilets but tourists are advised to use water economically since there’s only limited supply of fresh water on the island. Lengkuas island is only inhabited by 3 people, and all three of them are the lighthouse operator. But sometimes, they are more the guides for tourists who visit the the island.